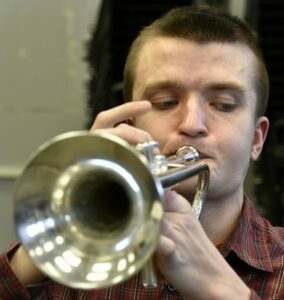 Trumpet player Nathanael Batson, who suffers from a rare disorder that's caused him to go blind, has won the National High School Heart of the Arts Award for New England, New York and New Jersey. FAIRFIELD — If the National Federation of State High School Associations closed its eyes and imagined what a National High School Heart of the Arts Award recipient might look like, it would see Nathanael Batson. 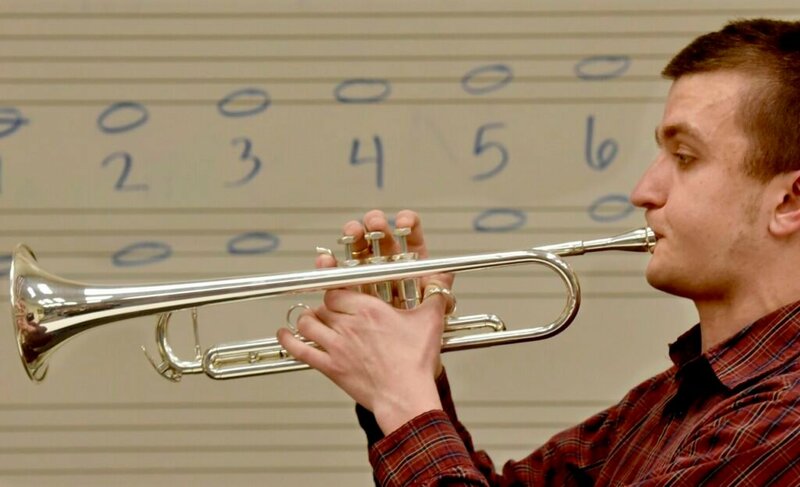 The Lawrence High School senior musician has been selected as the 2019 Section 1 recipient of the Heart of the Arts Award, making him eligible to be the national winner, who will be recognized June 29 at the NFHS summer meeting in Indianapolis, Indiana. Nathanael, 18, is legally blind despite three rounds of chemotherapy that began at age 5. “I’m honored,” he said Thursday in the music room at the high school in Fairfield. “It just kind of shows, with respect to what I’ve been through, my tribulations and adversities. I’m so overcome, and I so love music. Like his sister Corina, 30, and his mother Yvonne, 59, Nathanael has a rare hereditary disorder, neurofibromatosis, which causes tumors throughout the body. Yvonne’s tumors were in her right leg, which was amputated in 2006. She walks with a prosthetic leg. She was the first in her family to develop the disorder — a spontaneous mutation of cells that formed the tumors. Corina developed a tumor on the optic nerve behind the eye. Fifteen months of chemotherapy allowed her to see again. Nathanael, an Eagle Scout with more than 40 merit badges, has the same optic pathway glioma that his sister had, but it was worse and he is still being treated. The National High School Heart of the Arts Award was created by the NFHS to recognize individuals who exemplify the ideals of the positive heart of the arts that represent the core mission of education-based activities, according to promotional material. This is the sixth year that the National High School Heart of the Arts Award has been offered. Batson has not allowed his physical ailments to define him or to restrict his numerous pursuits, organizers said. Loren Fields, the high school music teacher, could not agree more. Nathanael’s mother, Yvonne, said music has always been an important part of Nathanael’s life, and this award means a lot to him and to his family. In October 2017, Nathanael was taken by ambulance to the Boston Children’s Hospital because of a shunt failure. He spent three weeks in the hospital, twice in intensive care. He had three brain surgeries to regulate the shunt, which allows movement of fluid. 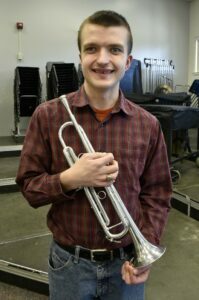 In music, Nathanael has qualified and played with the Kennebec Valley Music Educators’ Association Band every year of high school and the All-State Band as a sophomore. Batson memorizes all of his music and is well-known for his stirring performances of the Star-Spangled Banner at school, civic and community events. Outside of music, Batson achieved the rank of Eagle Scout with the Boy Scouts of America during his early teens by organizing a Pops Band that performed a free concert at the Maine Veterans’ Home in Augusta. He also participated in the 2017 National Scout Jamboree Band in West Virginia, which performed for more than 40,000 people from around the world. Nathanael is currently on an oral chemotherapy regimen to try to stabilize his vision, and it appears to be working, his mother said. His vision has not changed in over a year, and for now, his oncologist feels it is prudent to continue the treatment. The NFHS divides the nation into eight geographical sections. The states in Section 1 are Maine, Vermont, New Hampshire, Massachusetts, Connecticut, Rhode Island, New York and New Jersey. Nominations for this award were generated through federation-member state associations and reviewed by the Heart of the Arts Award Selection Committee composed of state association staff members. The NFHS, based in Indianapolis, Indiana, is the national leadership organization for high school sports and fine arts activities. It establishes consistent standards and rules for competition and helps those who oversee high school sports and activities. The NFHS writes playing rules for 17 sports for boys and girls at the high school level. Through its 50 member state associations and the District of Columbia, the NFHS reaches more than 19,000 high schools and 11 million participants in high school activity programs, including more than 7.9 million in high school sports. For more information, visit the NFHS website at nfhs.org.